As we had the previous morning, we woke early on Friday, August 3. 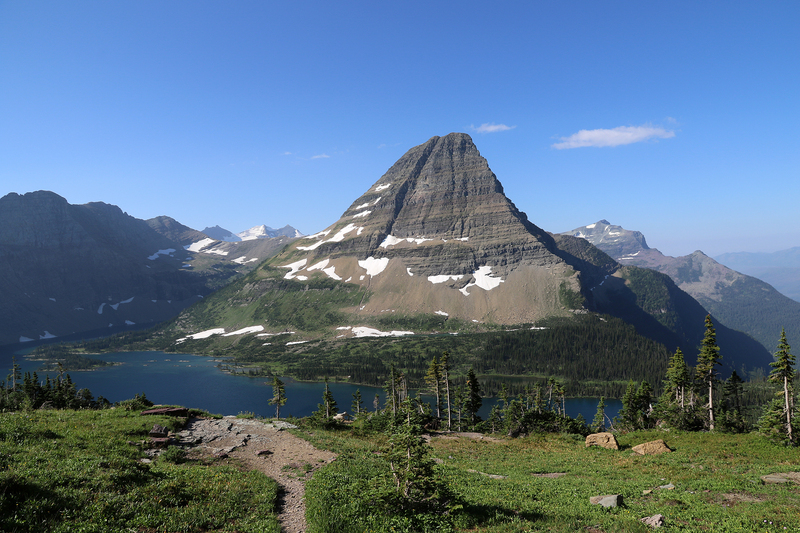 Our goal was to return early to Logan Pass to do the short hike to Hidden Lake Overlook and hopefully see some Mountain Goats and other wildlife. Then in the afternoon we’d go over to Many Glacier and reserve boat tickets for a hike over the weekend. This entry was posted in Journey and tagged Camping, Day Hike, Glacier, Montana on October 29, 2018 by Brandon Hayes. 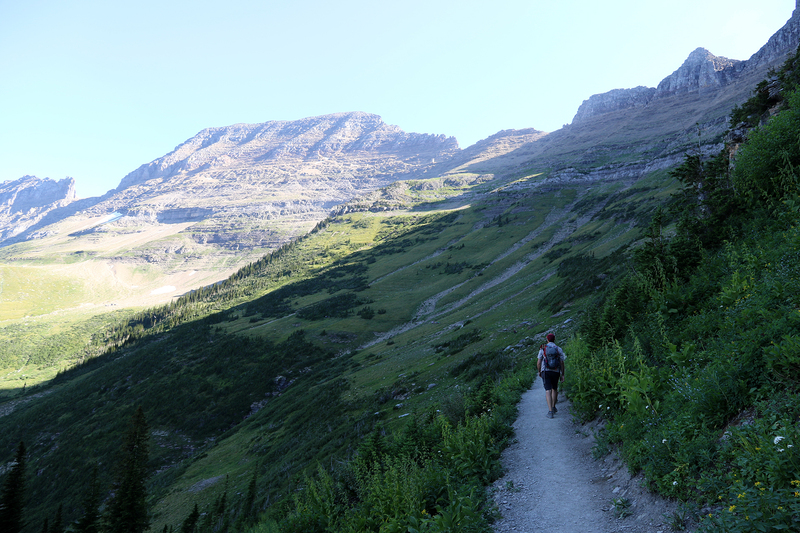 The Highline Trail along Glacier National Park’s Garden Wall is one of the great hikes in the entire National Park system. It is simultaneously splendor-drenched and intimate. As gorgeous a view as you can find anywhere unfolds around you while up close, a delicate micro-habitat is home to bouquets of wildflowers. It is the extreme of expansiveness and quiet. It is also terrifying for someone, like me, who is afraid of heights. Nevertheless, Sean’s and my first full day in Glacier, Thursday, August 2, was spent on the Highline with friends who return to it like a pilgrimage to a holy site. This entry was posted in Journey and tagged Camping, Day Hike, Glacier, Montana on October 26, 2018 by Brandon Hayes. Just before 3pm on July 4, Sean and I departed Mist Falls and began the hike down Paradise Valley. The Falls marked the farthest into the heart of the Sierra Nevada that we would reach on this trip. The following day we would continue on to the third part of our California trip: three nights in San Diego and Andrew and Yesi’s wedding. This entry was posted in Journey and tagged California, Day Hike, Kings Canyon on September 28, 2018 by Brandon Hayes. 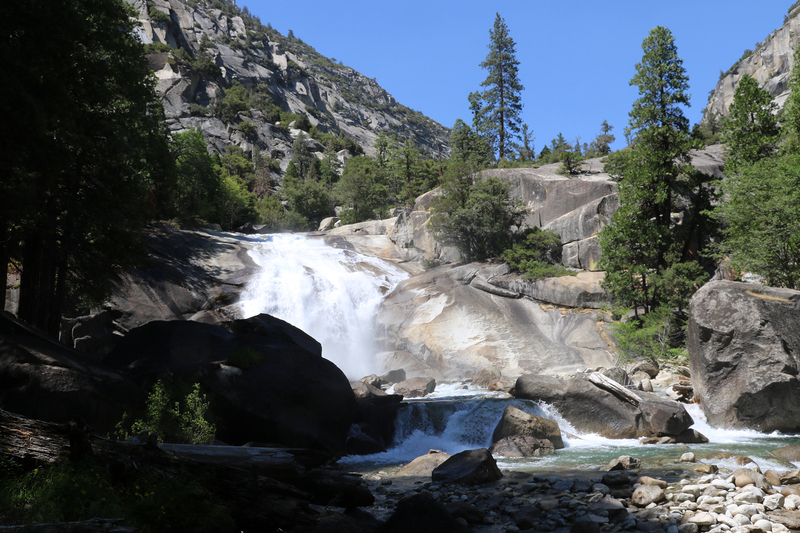 For our Fourth of July day hike in Kings Canyon National Park, Sean and I chose the popular trail to Mist Falls on the South Fork of the Kings River. From the parking area at Roads End, the trail gains about 800 feet of elevation in just under four miles, with most of the elevation gain at the end. This entry was posted in Journey and tagged California, Day Hike, Kings Canyon on September 19, 2018 by Brandon Hayes. At a little after 1pm on July 3, Sean and I reached the southern edge of the plateau on which Sequoia National Park’s Giant Forest sits. We were at the junction of Trail of the Sequoias and High Sierra Trail. 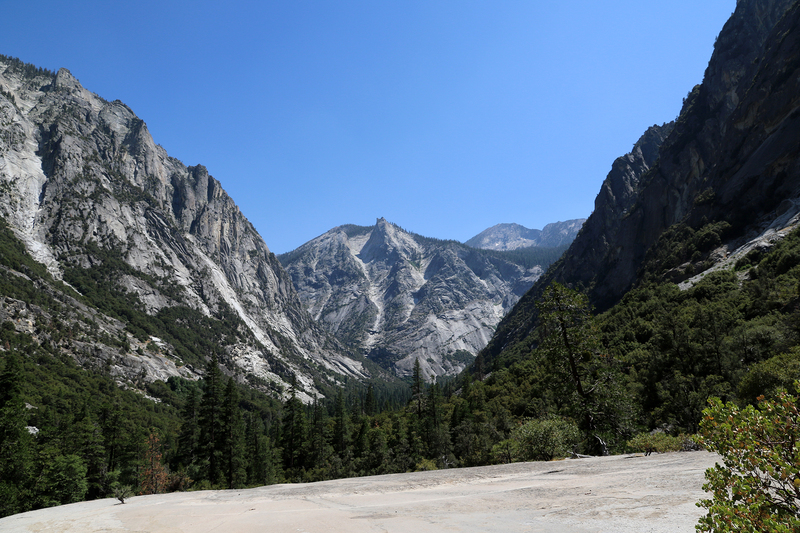 In front of us to the south was the gorge of the Middle Fork of the Kaweah River, some 3,700 feet below. Beyond were the ridges and peaks of the southern Sierra Nevada. This entry was posted in Journey and tagged California, Day Hike, Sequoia on August 31, 2018 by Brandon Hayes. Between the heavy pine and silver fir zones towers the Big Tree (Sequoia[dendron] gigantea), the king of all the conifers in the world, “the noblest of the noble race” … It extends, a widely interrupted belt, from a very small grove on the middle fork of the American River to the head of Deer Creek, a distance of about 260 miles, its northern limit being near the thirty-ninth parallel, the southern a little below the thirty-sixth. The elevation of the belt above the sea varies from about 5000 to 8000 feet … Southward the giants become more and more irrepressibly jubilant, heaving their massive crowns into the sky from every ridge and slope, waving onward in graceful compliance with the complicated topography of the region. The finest of the Kaweah section of the belt is on the broad ridge between Marble Creek and the middle fork, and is called the Giant Forest. It extends from the granite headlands, overlooking the hot San Joaquin plains, to within a few miles of the cool glacial fountains of the summit peaks … and is included in the Sequoia National Park. It was not yet 10:30am as we turned from the throng at the base of the General Sherman Tree and started into the Giant Forest on the popular, paved Congress Trail. I had a general sense that we would ultimately end up at the Giant Forest Museum (where at 6:30pm, the shuttle would return us to Three Rivers) by way of Moro Rock. But our exact route through the grove was yet to be determined. This entry was posted in Journey and tagged California, Day Hike, Sequoia on August 23, 2018 by Brandon Hayes. 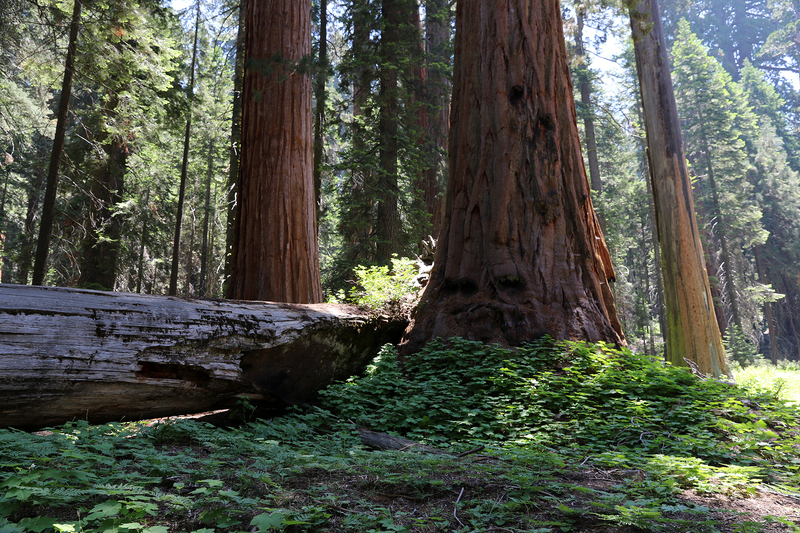 Sequoia National Park was established on September 25, 1890 as the second National Park in the system. Its original primary function was to protect a number of groves of Giant Sequoias in the southern Sierra Nevada from logging. One grove of the famed trees had already been protected in 1864 when Yosemite Valley and Mariposa Grove were given to the state of California for permanent protection. 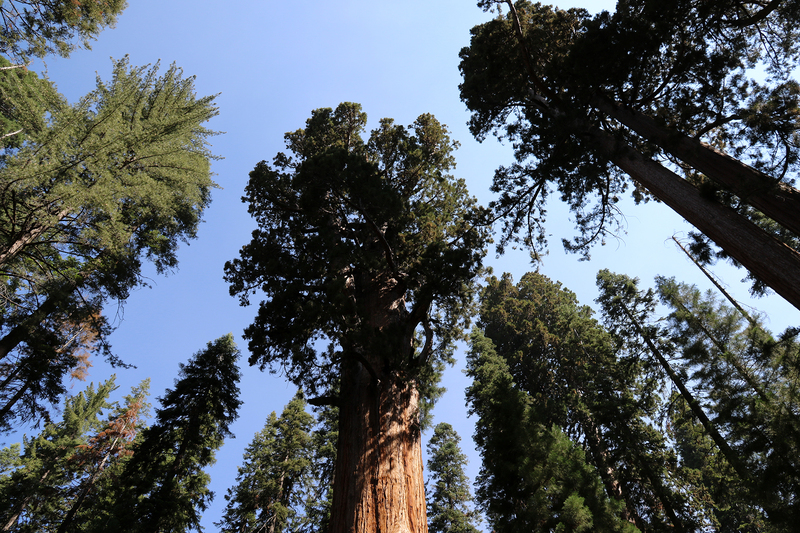 On October 1, 1890, several days after Sequoia National Park was created, another grove of Giant Sequoias was protected as General Grant National Park (which in 1940 would grow to become Kings Canyon National Park). General Grant National Park protected the grove around the General Grant Tree, thought to be the largest in the world until 1931 when Sequoia National Park’s Sherman Tree was discovered to be larger. On that same October day in 1890, hundreds of thousands of acres around Yosemite Valley were also protected as Yosemite National Park, although the Valley and Mariposa Grove wouldn’t officially join the National Park until 1906. All told, a flurry of legislation in early autumn 1890 began a process that would eventually set aside over 1,615,000 acres of the Sierra Nevada as National Parks. Over 404,000 of those acres were Sequoia National Park. This entry was posted in Journey and tagged California, Day Hike, Sequoia on August 16, 2018 by Brandon Hayes.